Hello everyone! As it’s a new year and (hopefully) the beginning of a new journey for me, I wanted to go back over a bit of my history up to this point. Those of you who have known me for a long time will already know these stories, so feel free to skip them. Also note that this post will be long! I was a thin child growing up, and a competitive swimmer all through adolescence. I never struggled with weight until my sophomore year of college, a few months after a dental procedure caused a hidden infection to start eating away at my body. For eleven years, I suffered from constant illness and other health issues, including sudden weight gains and losses at random, often-very-short intervals. By the time the infection was found and treated, I’d gained a net of 130 lbs. Since I was underweight before the gains started, my goal was to lose 100-110 lbs. Weight loss is a long, difficult process for someone with PCOS and insulin-resistance, so it took a little over three years to hit that goal of 100 lbs lost, but I made it and then maintained the loss for nearly two years. In 2014, my family moved to Boston, and our lives pretty much fell apart. I won’t go into details, but it was bad bad bad for everyone. Personally, I developed disordered eating habits and began to binge eat and drink. Additionally, I was put on a medication with a common side effect of weight gain, and indeed the combination of my binging and the medication led to rapid regain. Not long after I got off the medicine and (mostly) stopped binging, I broke my foot and was unable to exercise much for two years (due to them treating the foot as sprained for 18 months first). It’s now been seven months since my foot was healed, five months since we moved back to Texas (fourth cross-country move in three years), and less than a month since our family’s financial stress began to ease slightly. 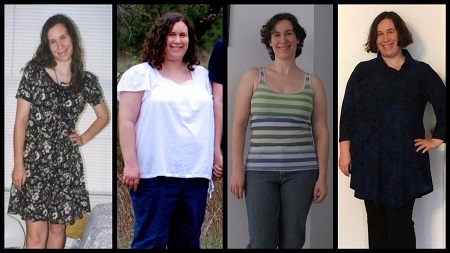 Altogether, I regained 70 lbs, and my goal is to lose 70-80 lbs. I’ve been maintaining my current weight for about 18 months now. Growing up, I was the oldest of four. (There are five now, but my half-sister was born when I was 24.) My first sister and I were always close. Physically, we are very different. I have the medium-large bone structure from my dad’s side of the family, and my shoulders, hips, and thighs are wide/large because of all the swimming I did as a teen. My sister took after the bird-bone structure of my mom. Her healthy weight is under the BMI range for her height, whereas my healthy weight is at the top of my range or a bit over it. 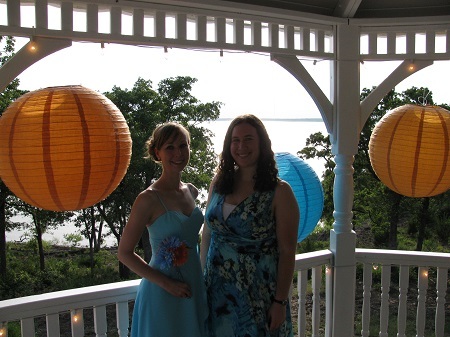 My mom was always obsessed with weight/size because of her own body image issues, which of course affected me, and then the side-by-side living with my sister made me even more self-conscious. I thought I was fat at 120 lbs (at the very low end of a healthy BMI for my height, and skeletal when you see all my knees and elbows bulging everywhere – see photo above). It’s taken me a long time to understand that my body is perfectly happy and healthy at 155-160 lbs, even if I’m technically overweight at those numbers. Though I was only 20 lbs overweight here, I felt enormous next to my sister. We have very different body types! When I was at my highest weight in 2009, I was miserable. I definitely equated my size with failure and unhappiness, despite having a wonderful life at the time in so many ways. I went on my weight loss journey from a place of shame, and only after I hit my goal did I began to work on my body image issues. They have certainly gotten much better! Despite currently being only 30 lbs under my highest weight, I love my body. Sure, I want to lose weight and get fitter and all that jazz, but I love my body, too, and I won’t try to force myself to lose more than is healthy for my individual needs. The running picture below? Technically overweight, but exactly where my body is happiest and healthiest! I’ll aim for that! As stated above, I was a competitive swimmer growing up. By my senior year, I was completely burned out and I quit. I entered a period of time where I exercised a lot but not for any sport. Then in 2011 during my weight loss journey, I took up running. I was never great at it, but I enjoyed it and enjoyed participating in 5Ks. I did that until we moved to Boston, at which point the family problems and change in routine did me in. Due to injuries, I’ve been unable to take it back up, though I really hope to at some point. In the meantime, I’ve come to love yoga. I began to practice yoga not for fitness, but to help with severe anxiety. Yoga is great for building strength as well as for my mental health, and it’s now my very favorite physical activity. As for the water sports…well, it’s been over 20 years since I trained competitively but to this day I despise getting in the water. This is entirely due to the hard training, not discomfort in a swimsuit (I’m more comfortable in a swimsuit than in dresses!). I love the way a pool smells and I love being next to a pool, but it takes a lot to get in one, and I don’t really enjoy my time in the water whether I’m there for play or exercise. This is really too bad, but it’s a common story for competitive swimmers. Those early athletic years have really affected my whole life, though. My resting heart rate will likely always been lower than normal for my size. A few years back, when I was at a healthy weight, a doctor (that I hadn’t met yet) got concerned after a test revealed that my heart rate was around 50 bpm and I only took about six breaths per minute. Before I went for my results and met the doctor, he was unsure if I was having problems (asthma or blocked arteries…) or if I was a runner. Even now, 70 lbs overweight, morbidly obese, my RHR is around 60-65 bpm. My body was also permanently changed by swimming – my wide shoulders and hips, my thick thighs, the dimples behind my shoulders…all from the water. On a more negative note, all that training gives me a tendency to overtrain my body now, which leads to a kind of exercise-induced starvation mode, making it even harder for my body to drop weight, since it’s trying to hold on to every calorie for grueling training sessions. But on the bright side, I have a very high percentage of muscle, a very high basal metabolic rate, and my body adapts easily to physical activity. For all these things, I am really thankful for that early athletic training. Two big things affected my nutrition from a very early age. First, I was born with what’s known as a super-taster gene. My tastebuds can pick up the minutest taste of things, which is good in some ways but makes stronger flavors extremely difficult to handle. Second, I’m 99% sure I had sensory integration disorder, which wasn’t really known about when I was born. My middle son was born with it and received occupational therapy to help, but I never did of course. SID makes a person particularly sensitive to cross-sensory perceptions. They often have problems with textures, temperatures, and too much stimulation. My son, for instance, couldn’t eat rice cereal after graduating from milk as an infant. He had to have perfectly smooth whole-fat plain yogurt instead. Textures are a big deal for me as well (both in and out of the mouth), and the combination of that and the super-tasting meant Bad Things. I wouldn’t eat most things as a child, and my young parents wouldn’t make me try any foods twice. The upshot: I grew up eating next to no produce and limited other foods, and I didn’t try to change this for a long time. In 2011, I made a goal to eat one vegetable and one fruit six days a week. I didn’t always succeed, but I did as best as I could. Six months later, I added one additional vegetable or fruit five times per week. It took until November that year before I found a vegetable that I liked (rutabaga), and it took 18 months before I had more produce on my “I can eat” list than my “I can’t eat” list. I’m still extremely picky about freggies – they have to be at specific ages, ripeness, temperatures, textures, etc, and most I can only eat after cooking in specific ways. This is far better than it was before, though. I think in 2011 I stated that I’d had more fruits and vegetables that year than I’d had in the rest of my life combined. While I’m not quite as good with produce as I was a few years ago, I’m still far better than I have been for most of my life, and I’m still trying to improve. Anyway, that’s about it – the history of how I got to where I am now in body, mind, fitness, and nutrition! Sorry again about the length of this post! 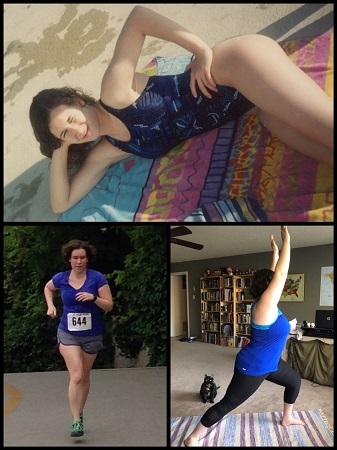 This entry was posted in Wellness and tagged body image, fitness, health, Wellness Wednesday. Bookmark the permalink. I’ve said it before but it is worth repeating. I do love your honesty and openness about your journey towards total body health (including mind). I always think of you when I am in a period of mental self-flagellation. Knowing that I am not alone makes all the difference some times. I’m am just so very amazed at home you always articulate things so damn well. You really do have a fantastic voice in your writing and I really dig it! Hopefully, you don’t take this wrong but thick thighs or not, shoulders and muscles here and there you have always been very pretty no matter what size you were! Thank you so much for sharing as it really does motivate me to read what you write! Have a marvelous day and keep your head up!